October 2, 1963 Sandy Koufax Type 1 United Press Int'l Photo/Measures 8" x 10" – Koufax Strikes Out 15 Yankees in 1963 WS Game #1 – Image Used for Koufax's 1964 Topps #136 Subject! 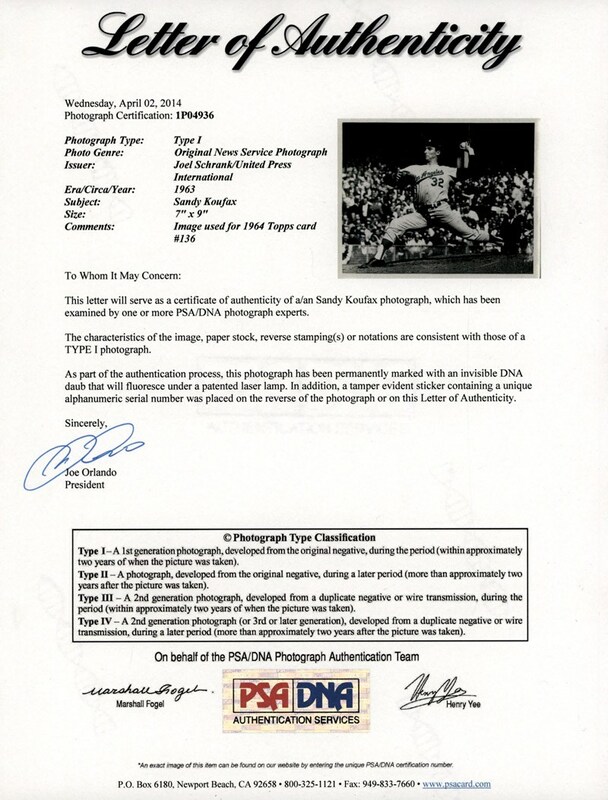 One of the most incredible Sandy Koufax photos is presented here with a Full PSA Type 1 LOA. This outstanding 8" x 10" offering portrays the classic Koufax pitching form pose and was issued on October 2, 1963 when the fire-balling southpaw struck out a then record 15 Yankees in Game #1 of the 1963 World Series at Yankee Stadium! 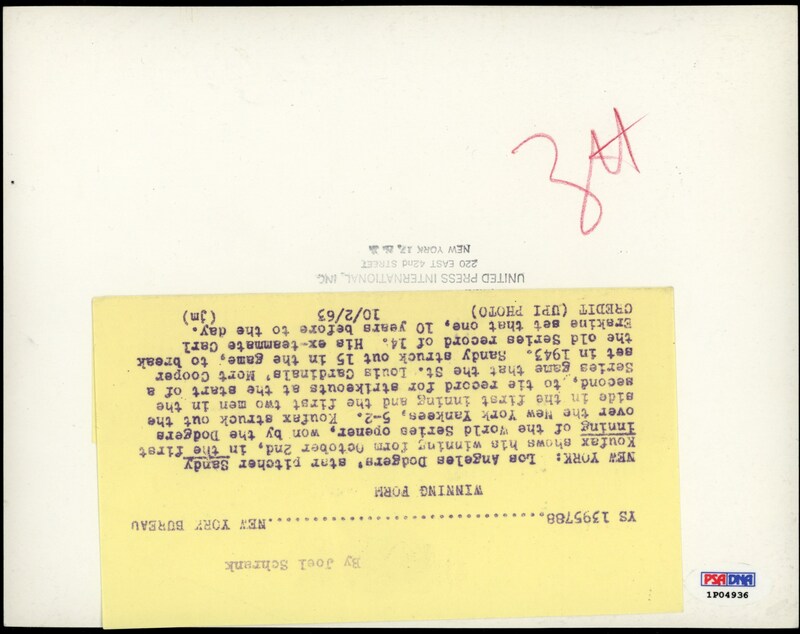 Going the distance to defeat the mighty Yankees by a 5-2 score, Koufax's blazing fastball and "nose to toes" curveball would be too much for the Yankees to handle, with the Bronx Bombers virtually swinging at air that entire afternoon. Koufax would toe the rubber again in Game #4 in Los Angeles to once more thwart the great Yankees attack, besting the Yanks 2-1 to clinch the 1963 Fall Classic in a four-game sweep. Although Koufax's record 15-strikeout game would eventually be bested by Bob Gibson's 17 K's in the 1968 Fall Classic against Detroit, it still goes down as one of the most dominating performances in World Series history. 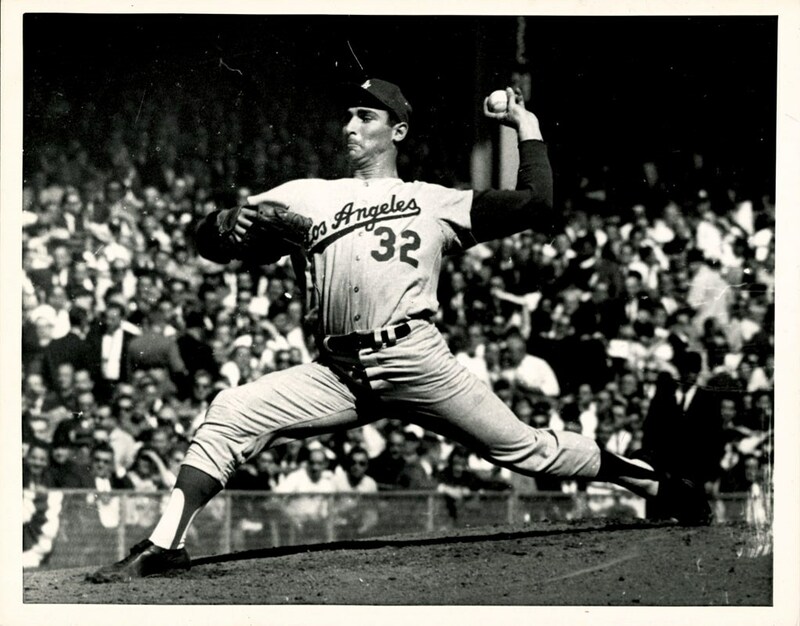 In fact, Koufax would open the game with five consecutive strikeouts that still stands as a Series record. This photo not only resides as a sheer testament to Sandy's remarkable performance, it also resides as the EXACT IMAGE used for his 1964 Topps #136 Subject that boldly reads: "KOUFAX STRIKES OUT 15"!